The base plate of the PM867 controller has two RJ45 Ethernet ports (CN1, CN2) for connection to the Control Network, and two RJ45 serial ports (COM3, COM4). One of the serial ports (COM3) is an RS-232C port with modem control signals, whereas the other port (COM4) is isolated and used for the connection of a configuration tool. The controller supports CPU redundancy for higher availability (CPU, CEX-Bus, communication interfaces and S800 I/O). The high integrity functionality is enabled by the addition of a SM812 module and the SIL certified software. 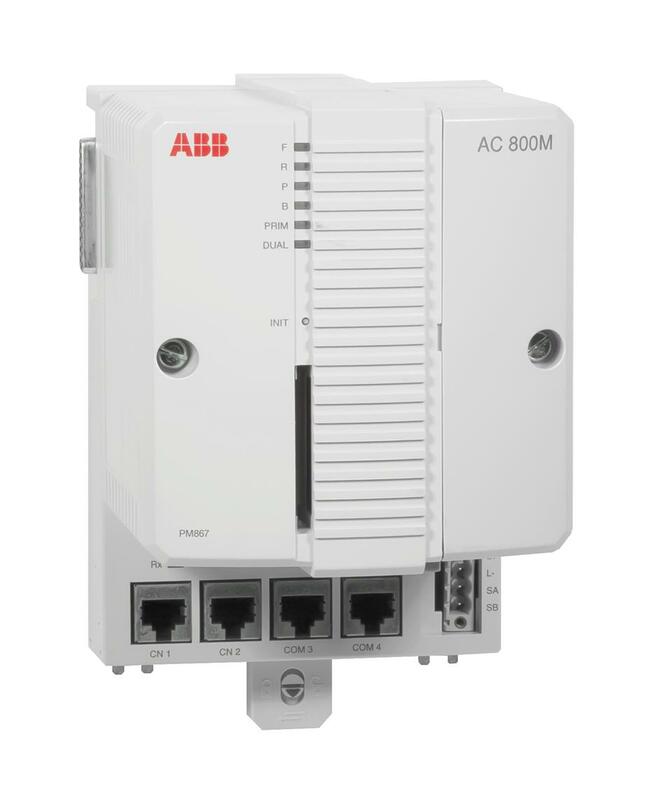 The AC 800M High-Integrity also offers IEC 61508 and TÜV-certified control environment for combining safety and business critical process control in one controller unit without sacrificing the safety integrity. Only compatible for 800xA 6.0.2 and onwards. Please see: Product Update for more information.